Discover out-of-the-way places like Eastern Beach Reserve and Split Point Lighthouse. Get a sense of the local culture at Art Gallery of Ballarat and Shrine of Remembrance. 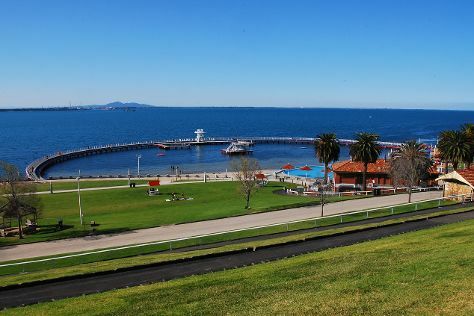 Change things up with these side-trips from Melbourne: Torquay (Bells Beach & Spas), William Ricketts Sanctuary (in Mount Dandenong) and Ballarat (Lake Wendouree, Ballarat Botanical Gardens, & more). There's still lots to do: admire all the interesting features of Royal Botanic Gardens, steep yourself in history at St. Patrick's Cathedral, admire the landmark architecture of German Lutheran Trinity Church, and explore the different monuments and memorials at Historic St Andrew's Anglican Church. To find more things to do, reviews, other places to visit, and tourist information, refer to the Melbourne travel route builder . If you are flying in from Singapore, the closest major airport is Melbourne International Airport. In October, daytime highs in Melbourne are 24°C, while nighttime lows are 9°C. Cap off your sightseeing on the 28th (Mon) early enough to travel back home.